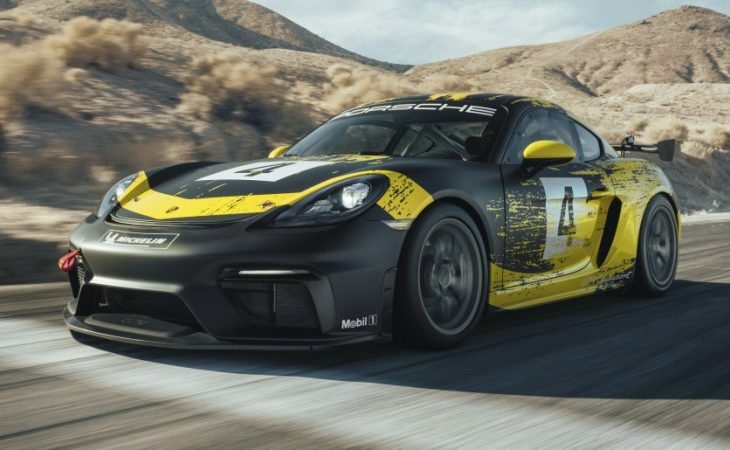 Porsche is starting off the 2019 track season with a bang: the new 718 Cayman GT4 Clubsport looks aggressive and capable, and gets a power boost too. Professional and hobbyist drivers will like the response of the 3.8-liter flat-six engine setup paired with a six-speed PDK transmission. This revised build results in the production of 420 horses, which is about a 10% increase over the outgoing model. A limited-slip differential keeps this Cayman right where you want it. Porsche’s following will notice the Cayman’s updated bodywork accented by a natural fiber composite rear wing and doors. Crafted from plant fibers like hemp and flax, the new bodywork is both eco-friendly and aerodynamic. The GT4 Clubsport is dressed in a utilitarian matte-finished coat, too, giving it an all-business appeal with just a hint of swagger. Interested customers can select from the “Trackday” or “Competition” versions, both of which are equipped with a racing seat, six-point harness, air conditioning, and a roll cage. Available starting at $153,000, the base Trackday features fixed shock settings and a 21.1-gallon fuel cell. The Competition model is accented with a brake bias adjuster, onboard air jacks, three-way adjustable shocks, a quick-release steering wheel, and a 30.4-gallon fuel cell. Available starting at $179,000, the upgraded model also includes an automatic fire extinguisher system. Porsche is currently taking orders for both variants.